The HHS All School Reunion is just around the corner. 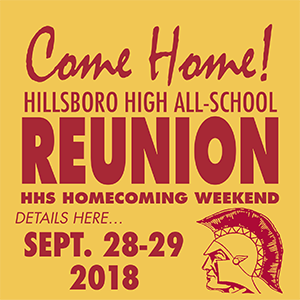 It is scheduled for the weekend of hillsboro high School homecoming Sept. 28-29. By making your reservation for the Saturday even­ing banquet and paying your optional Alumni Association dues you are eligible to attend the Friday night homecoming football game against the Wabaun­see Chargers at no charge as long as you sign up when signing up for the banquet. If you are curious about what is going on in the Hillsboro schools these days, you are invited for lunch at the low cost of $3.00. for fun and fellowship with your former classmates and other alumni who choose to attend. If lunch isn’t your thing, or if you have other plans for lunch, you are still invited to join the group for a school tour or you can sign up for other activities to see what the students are doing these days. Then stick around for the homecoming parade downtown and watch or be in it. The homecoming pep rally follows it. Everything is detailed in the Oracle. Copies are available at the Free Press or contact Cynnie (Washmon ’64) Fleming and ask her to send you one. cfleming1105@gmail.com. Or go to the Free Press web site as mentioned earlier in this column. We have a great meal lined up with great entertainment for the banquet—The McPherson Community Brass Choir. John Duerksen, the class of 1968 is a member of the group. Also, members of the class of 1968 will be performing a Medley of Tunes from the Musical Oklahoma. And a bonus—Senior photos from the classes of 48, ’58, ’68 and ’78 will be posted around town in some businesses windows so you can take a walk down memory lane. This big old bear goes into a restaurant and the waiter asks him what he would like to eat. The bear thinks a minute and then says, “I’ll have a grilled… …cheese.